COLUMBUS, Ohio - New research is detailing how environmental stressors, including heavy metals, brought on by human activity are harming coastal green sea turtle populations - work that researchers hope will inform conservation efforts going forward. 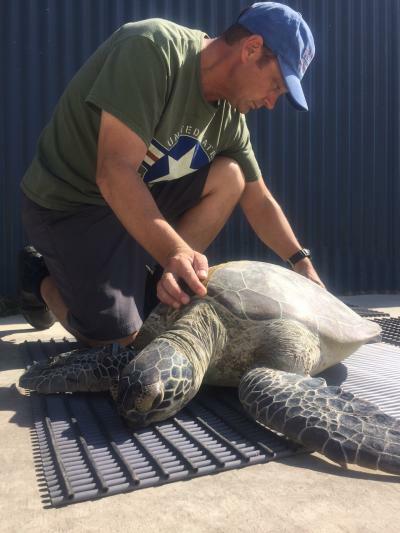 In a study that appears in the journal Science of the Total Environment, a multidisciplinary group of researchers set about evaluating turtle health, water quality and other factors in the aftermath of a catastrophic mass death of green turtles in Australia. "We found evidence of heavy metals - particularly cobalt - in sea turtle populations where we also saw signs of illness," said lead author Mark Flint, program head of Zoo and Wildlife Conservation Medicine and Ecosystem Health in the College of Veterinary Medicine at The Ohio State University. "Though we can't be sure what caused this, there were cyclones and major flooding in this part of Australia two years prior to the start of our study, and that could have drawn out sediment rich in heavy metals that had been lying in rivers and streams benign for the past 50 years," Flint said. Green turtles, Chelonia mydas, are an endangered species, and one of the largest sea turtles, weighing in at as much as 400 pounds in adulthood. Green turtles are named for the greenish color of their fat, not their shells, and are found mainly in tropical and subtropical waters, according to the World Wide Fund for Nature-Australia (WWF). The WWF provided funding for this research, and led the Rivers to Reef to Turtles project under which it was conducted. Large populations live, feed and nest on Australia's Great Barrier Reef, favoring the bays and protected shores near the coast and around islands. The Rivers to Reef to Turtles project, which ran from 2014 to 2017, examined health of green turtles at two northern Queensland bays - Cleveland and Upstart - known to be impacted by urban and agricultural human activities and at a third remote "pristine" area, the Howick Group of islands. Following up on a high number of turtle deaths in 2012 and 2013 that conservationists were attributing to a "whole kit and caboodle of reasons" including runoff from agriculture, industrial toxins and climate change, the team conducted physical exams and tested the turtles' blood over time, looking for signs of contaminants and illness, Flint said. They also counted barnacles on the turtles. Flint's previous work has shown that high barnacle counts on turtles' undersides correspond to poor health. The theory behind that? When healthy and feeding normally, a turtle's trips to the sea floor for seagrass meals effectively scrape away barnacles. When the green turtles aren't eating well, the barnacles build up. "An unhealthy turtle often has trapped air in its shell and is buoyant, meaning it can't dive down for food. It's almost like a balloon," Flint said. "Also, a turtle that can't dive sits on the surface of the water where algae and barnacles can grow better." In cases where the researchers found dead turtles, they conducted in-depth necropsies. The research team found elevated levels of an enzyme called creatinine kinase in turtles at Cleveland Bay. That enzyme typically increases after muscle injury or illness. And they found elevated white cell counts in turtles at Upstart Bay. White cells proliferate when an animal is fighting infection.